India gas genset market recorded a declining trend over the past 2-3 years owing to lower product awareness coupled with strict emission norms by Central Pollution Control Board (CPCB) of India. However, surging environmental awareness is predicted to result in consumer shift from diesel genset towards gas genset over the coming years. Further, the gas genset market is projected to recover in near future on account of improving gas pipeline infrastructure in the country along with government efforts towards creating consumer awareness regarding environment friendly products, development of City Gas Distribution (CGD) network and subsidy on using renewable resources. According to 6Wresearch, India gas genset market size is projected to reach $31 million by 2024. Due to launch of new norms, the market especially in industrial vertical which includes power utility segment was majorly impacted during last few years. This also resulted in increased prices of gas gensets, which further impacted the growth of the market during 2014-17. Standby power application bagged the highest India gas genset market share in 2017, while peak shaving and primary power applications contributed nearly 15% altogether. Furthermore, in terms of gas genset rating, 375.1 kVA-1000 kVA segment captured the largest India gas genset market revenue share while low rating genset up to 100 kVA attributed for largest market volume share in 2017. With ongoing demand for medium rating gas genset from commercial and industrial segments, 100.1 kVA-375 kVA segment is projected to exhibit high growth during the forecast period. 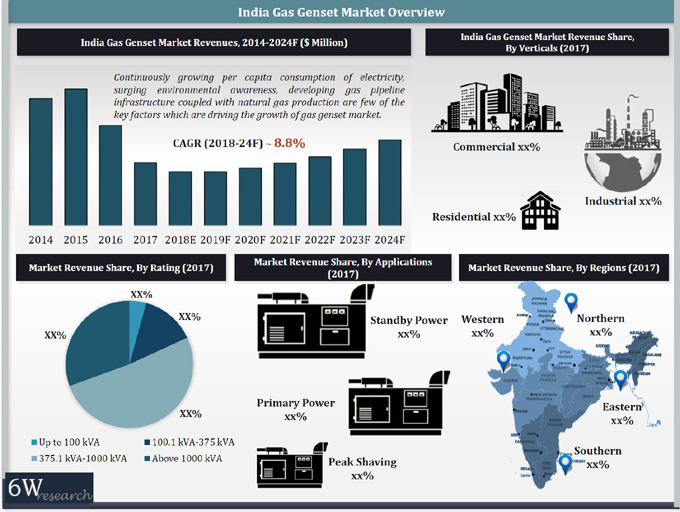 The India gas genset market report thoroughly covers India gas genset market by rating, verticals, applications, and regions. The India gas genset market outlook report provides an unbiased and detailed analysis of the India gas genset market trends, opportunities/ high growth areas and market drivers which would help the stakeholders to decide and align their market strategies according to the current and future market dynamics. 15.2. Caterpillar India Pvt. Ltd.
15.4. Mahindra & Mahindra Ltd.
15.5. Cooper Corporation Pvt. Ltd.
15.6. Generac Power Systems Inc.
15.8. Kohler Power India Pvt. Ltd.
15.9. Green Power International Pvt. Ltd.
15.10. Kirloskar Oil Engines Ltd.